Breakfast: Scrambled Eggs with Green Onions, Ham & Cheese. I love scrambled eggs now but I always wonder why doctors OK them on our post-op eating plans so soon. They weren't my friend early on. After eating them it felt like I swallowed rubber balls no matter how I undercooked them or chewed. I learned after few tries though that if I added something like pesto & ricotta or a cheese sauce they slid down with ease and I gained a little more protein too. Moisture is key to keeping things heading in the right direction. 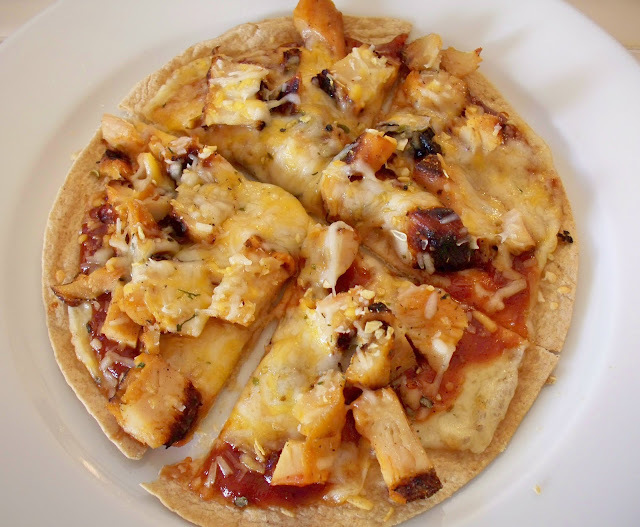 Shelly's BBQ Chicken Tortilla Pizza - Mission Carb Balance Whole Wheat Fajita Size Tortilla topped BBQ Sauce, Havarti & Co-Jack Cheese, leftover Grilled Chicken and a sprinkle of Italian Seasonings. Dinner: I wanted something with minimal prep and clean-up so I picked up a couple of pieces of fish and tossed them on the grill (packet style) and I made steamed peas to go with. Ingredients listed are for one packet multiply it for how many packets you are making. Place all ingredients in the center of a piece of heavy-duty foil (if you are using the $1 store stuff double it) Fold the foil over and seal each packet. I am dragging this morning. I was awakened at 2:12 AM by an earthquake. It shook and rumbled my bed and for a moment I thought... Am I having a dream that I'm in a cheap motel with one of those coin-operated massage beds??? Ooooh, Who am I with in this cheap motel??? This could get interesting. Alas, it was an earthquake. A 5.1 aftershock from the Baja quake the other day. So after I exchanged a few tweets with local pals confirming what we had felt I tried unsuccessfully to go back to bed. This is going to be a looooong day. Hope everyone has a great weekend. A special Happy Birthday to my pal Christina. She's having an 80's themed party. How cool is that?! Wish we lived closer... I'd be doing the Safety Dance with ya! Thank you for your votes http://www.progressosoup.com/souperyou/ in the contest this weekend. There's 3 more days of voting. Your site is AMAZING!!!! I just started to follow you and I wanted THANK YOU for blogging all of this food stuff. I'm only a month post-op and your site is so helpful!!! Wow so you can have coffee after WLS? Thanks Nicole :) I hope you enjoy all you try. @Jazzy Ha LOL If I didn't drink coffee I probably wouldn't get much liquid in (I'm a bad water girl so don't do as I do on that.) but yeah Most Dr's Nuts allow coffee after the first month or so (healing) some even before. Some Dr's prefer you stick with decaf but I wasn't restrictied to decaf thank goodness. I add my protein to coffee..... love it this way! If not for coffee would not get enough protein in because I'm not a fan if the shakes. I agree with the comment about Shelly, she has been a great inspiration to me and helped me through the tough times. Thank you Shelly! THANKS for the helpful info about eggs--I'm 5 1/2 mo out and still can't eat them even though I absolutely love scrambled eggs. I've tried them all kinds of ways-- soft baked, so softly scrambled they were runny, etc etc. I do put cheese in them, but it's the fat-free stuff, so that really didn't help. What would i do without you, Shelley, your information is SO valuable for me and so many others.